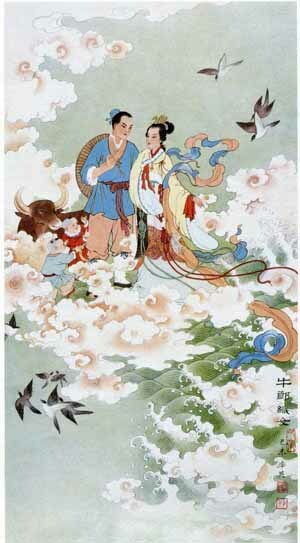 Qixi Festival (七夕节)， the seventh night of the 7th month on the Chinese lunar calendar, falls on August 9 this year. It celebrates the annual meeting of the cowherd (Niulang 牛郎) and weaver girl (Zhinu 织女) in Chinese mythology, so it is also called the Chinese Valentine’s Day. 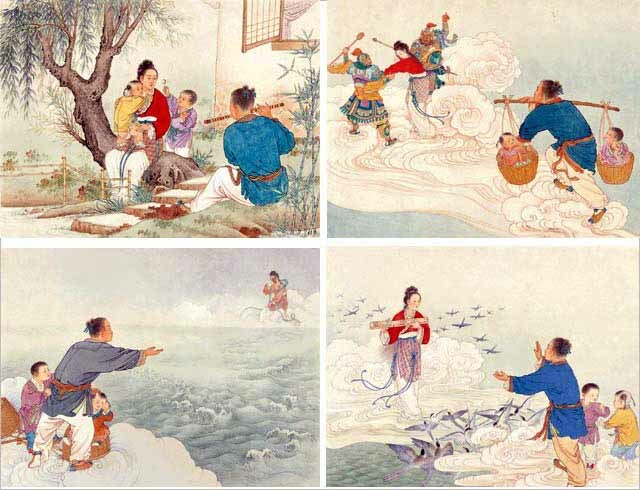 In the Heavens there lives the Jade Emperor, the Empress, and their seven beautiful daughters, the sisters are responsible for weaving the clouds and rainbows. The youngest daughter Zhinu (织女) was said to be the most beautiful and talented of them all. One day, the sisters go down to Earth to visit a sacred bathing pool. While they are playing, Niulang (牛郎) secretly steal Zhinu wings so she cannot leave. The older sisters have no choice but to leave without her. When the older sisters depart, Niulang comes out of hiding and the two fall in love. For years, Niulang and Zhinu live happily on Earth with their two children. One day, the Jade Emperor discover that Zhinu has been living on Earth. In their anger, the Jade Emperor send soldiers to retrieve Zhinu. Niulang chases after his beloved but the Jade Empress stops him. Using her hairpin, she creates a river (the Milky Way) through the sky, forever separating the two lovers. Back in the Heavens, Zhinu is heartbroken. In sympathy the Jade Emperor summons the world’s magpies to build a bridge across the Milky Way. Every year since on the 7th night of the 7th month, all the magpies of the world fly together so that the lovers can reunite.